It was a losing hand for Baton Rouge’s three riverboat casinos in 2018, with collective revenues plunging 15% to some $256 million from 2017’s more than $300 million. The steep decline, tallied from last January through December, comes as no surprise given L’Auberge Baton Rouge, Hollywood Casino and the Belle of Baton Rouge have each experienced 16 consecutive months of revenue drops, according to monthly reports from the Louisiana Gaming Control Board. Last year, the casinos performed the worst in July, collectively raking in 26.7% less revenue than the same month in 2017. March, meanwhile, was the area’s best month, yielding $27.4 million, though even that was an 8% drop from March 2017. 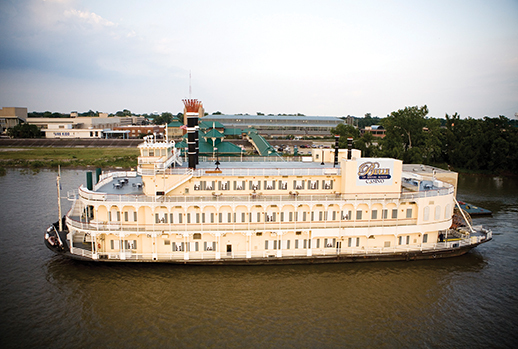 The losses have been especially burdensome for the Belle of Baton Rouge, which saw the largest percentage decline in annual revenues. The casino generated 23.3% less in 2018 ($44.4 million) than it did in 2017 ($57.9 million). And its 2019 outlook doesn’t appear much better: Late last year, executives with the casino’s new parent company, Eldorado Resorts, scrapped plans to upgrade the facility and move it onshore, despite a new state law allowing them to do so provided certain investment thresholds are met. That’s not to say revenues for Baton Rouge’s other two riverboat casinos are much better. Hollywood’s dropped by 14.7%, from $68.1 million to $58.1 million. And L’Auberge won about $153.2 million from its gamblers last year—a 12.2% decrease from $174.4 million the year before. Overall, Louisiana accumulated $1.92 billion in riverboat casino revenue, roughly the same as 2017. Check out last year’s riverboat revenue reports. And check out an October cover package where Business Report took a deep-dive into the local casino scene.